Decal kit for evinrude 25 hp from the mid 80's 1986, 1987, 1988. decal referenced as part number 0283334-0283335 and 0210654, 0210655-0210647 front and rear plate applique decals. 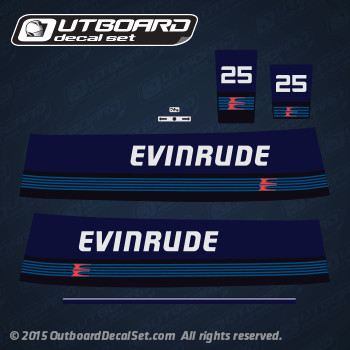 1987, 1988 Evinrude 25 hp decal kit 0283334-0283335 and 0210654, 0210655-0210647 plate decals. EVINRUDE 1987 E25ECUA, E25ELCUA, E25RCUR, E25RLCUR, E25TECUR, E25TELCUR ENGINE COVER. EVINRUDE 1988 E25ECCM, E25ELCCM, E25RCCA, E25RLCCA, E25TECCA, E25TELCCA ENGINE COVER.